Deluxe Jungle Croquet Wooden Play Set - 11 Pc Set! Round up the herd and grab a mallet! 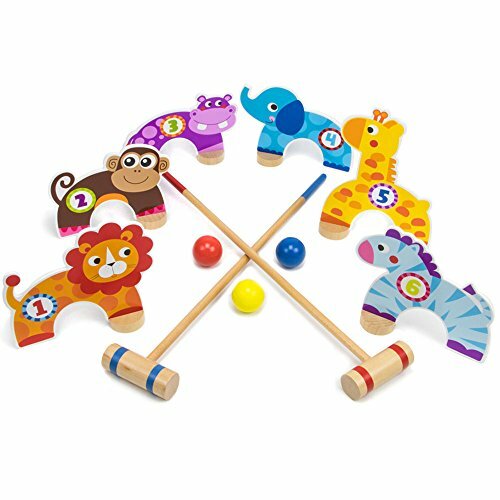 Little ones will have a wild time with this wooden croquet set. It comes with two mallets, three balls, and six jungle animal wickets: Lion, Monkey, Hippo, Elephant, Giraffe, and Zebra. The best part? They're customizable! Place the wickets in a line, or make a shape. Place them close, or far away. Once you're all set, use the mallet to hit the ball under each animal until you reach the end! This set comes with everything you need to teach little ones how to play this classic game. It's great for children to play solo or with a friend. The mallets measure approximately 21" tall and are ideal for little ones to play indoors or take outside. The set was made from textile and natural cuts of wood, then artfully designed with water-based safe paints. If you have any questions about this product by Imagination Generation, contact us by completing and submitting the form below. If you are looking for a specif part number, please include it with your message. Budweiser Croquet Set with Deluxe Carrying Case - Officially Licensed! Deluxe Heavy Duty Wooden 6 Player Croquet Set - Includes Bonus Carrying Case!